Eleanor Friedberger earned the pedigree for solo success long ago. Throughout 9 years and 9 albums as The Fiery Furnaces, she and her brother Matt have demonstrated an acuity and lust for the weird, while still maintaining a hand on the pulse of pop music and classic composition. Now, on Last Summer, Eleanor goes her own way and compiles a set of 10 tracks that feels both familiar and pleasantly mellow. The casual, cavalier approach to composition and pacing that we've seen in flashes from The Fiery Furnaces remains, but Eleanor also manages to hold onto pop and genre, bending them in more subtle, still accessible and pleasing experiments. Specifically, "The Inn of the Seventh Ray" reads very strongly like one of the epic medley tracks from recent Furnaces albums, but it also never breaks down into brutal madness. Instead, it progresses much the way we believe a song should. 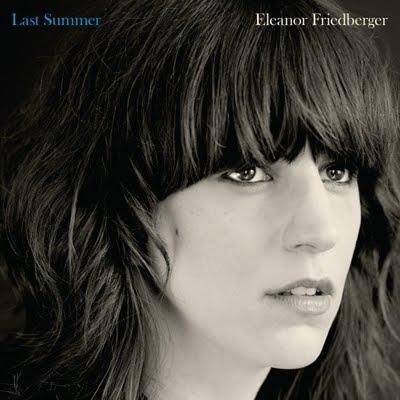 Eleanor Friedberger's songs are big, lush and beautiful. They lack abrasiveness, for the most part, and more often grind along as streams of consciousness. Of course, Last Summer, is excellent, loaded with callbacks not only to her band, but to the traditional progressions and gorgeous arrangements of blues, rock and jazz from the past. Next up is "Inn of the Seventh Ray," a track that is reminiscent of Furnaces stuff, but also calls to mind the lyrical idiosyncrasies that makes Eleanor Friedberger so interesting. Her stilted, breathy vocals combined with the melodic, story-telling nature of the song makes for something like "My Egyptian Grammar" or "Cabaret of the Seven Devils" from Widow City. "Heaven" slides into a more conventional rock/folk ballad narrative, painting images of heaven in a pile of elegant lyrics and soft-spoken vocals. And "Scenes from Bensonhurst" parades her gorgeous, syrupy voice and her poetic free-verse writing style. What is beautiful here, and throughout the album, is that a combination of piano and energetic guitar and electronic work, with vocal looping, among other things comes together to very nearly understate every song. This is an album that speaks softly and carries a big stick, but it's also an album loaded with insights about life, growing up and other philosophical concepts. Essentially, Friedberger takes complex ideas and makes them feel not only accessible, but elegantly simple, leaving the listener with a calm "a ha!" moment. "Roosevelt Island" picks up the pace, grinding away with some funky guitars and frenetic and harried lyrics, the kind we Fiery Furnaces fans love. And then "Glitter Gold Year" takes on blues and Motown elements, lead with the lyrics "It's a glitter gold year, two thousand and ten," backed by stomping pianos and thumping bass lines. But "One-Month Marathon" may be the best song, for its slow burn and contemplatively creepy overtones involving a child jealous of a new sibling, among other things. And there's subtle guitar work and unnerving sounds to cap the track. "I Won't Fall" is a strong song, in a very different vein from the tracks that precede it, but its breakdown is exceptional. And "Owl's Head Park" takes the long story-telling aspect of her songwriting to its extreme, beautifully. The instrumentation is chaotic and unpredictable, but still desirable and accessible, including of staggered call-and-response. The closer, "Early Earthquake" takes on a more conventional love song design, with quick stroke, clean electric guitar and click-clacking, clapping percussion. I've stopped handing out grades and scores, after a short experiment with that, but Last Summer deserves the special recognition of receiving a 38.5/44 on the Arbitrary Grading Assessment Numerical Representation scale (or AGANR scale). Listen to it below on he olde stream. Buy it from Friedberger's Merge Records page and love it, over and over and over again, the way it deserves.